Do you, or have you, run Pavise? 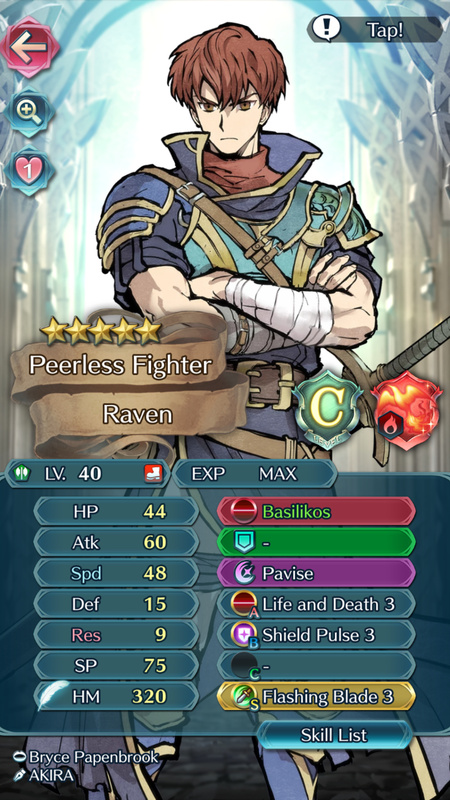 I was thinking of running a different build on my Lon’qu so he’s not running the typical Desperation set that everyone tends to run on fast Sword units. Shield Pulse, while unfortunate that it takes up the B slot, really helps in tanking hits from units considering the -5 damage when the Special activates, and it’s actually really cool to see him tank hits with Dual Life and Death like he’s a natural tank. The problem though is that he’s not gonna be dealing too much damage. While he can survive hits from +10 Black Knights throwing Black Luna’s (unless they initiate with Bold Fighter or something), his damage dealing suffers from the lack of a damaging Special. I’ve never gotten Saber and I really don’t like using Fjorm. I just don’t really like her or think she’s that great. Haven’t really tried using her too much outside of quests though, so. She’s fine. Not amazing, but very much a solid allround character. Saber is just great if you have a breath skill. You don’t know how much damage is negated by Aegis+Shield Pulse untill you try. He can survive a hit from Ishtar, as long as he avoids doubles. Yeah, it really is amazing just how much damage can be negated from these specials. -guard/special fighter can sometimes mess things up, like if he one shots them or if he doesnt kill and someone else gets danced in when he couldn’t charge pavise like usual. Overall, the build is a pretty pricey investment but a lot of fun and surprisingly strong, but it needs support to get the most out of it. I will say that it made chain challenges a breeze. Basically stick him along with a ranged tank and a healer and its ggez. For Lon’qu I only use a galeforce build with his L&D refine and fury. With the flashing blade seal and his obscene speed (54 at +10 with a spd boon) he always activates galeforce and this is useful for both offence and defence (retreating). While I haven’t used it much so I’m no expert, it is a fun and interesting build to do. Lon’qu may be able to do it better thanks to his better HP.